Your teeth can be a cause for great pride, great frustration and great sensitivity. The overconsumption of certain foods, poor oral care habits and other genetic factors can influence how sensitive our teeth are to certain textures and certain temperatures. 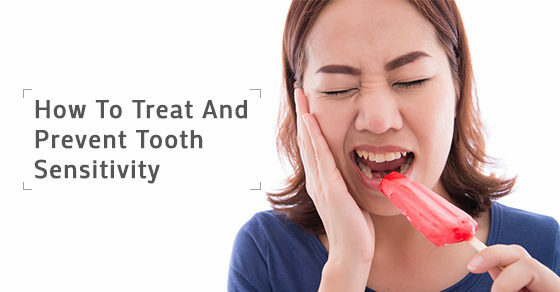 Tooth sensitivity can make eating and drinking, even daily life, quite unpleasant if not addressed. Below are some tips for treating and preventing tooth sensitivity. If you have sensitive teeth, it may be through no fault of your own. One of the main exacerbators of sensitive teeth is the toothpaste that you use. You might need to consider switching up your current toothpaste to something made especially for sensitive teeth. Speak to your dentist about possible toothpaste options, they probably even have something on hand for you to try. If you aren't using a toothbrush with soft bristles, if you are going at your teeth too aggressively or if you are not brushing for a full two minutes, than you are doing your sensitive teeth no favours. If you brush too vigorously, you can end up wearing away at your enamel which greatly increases your risk of tooth sensitivity. Acidic food and drink can also do a lot of damage to your enamel. If you are finding that you are experiencing an unusual amount of tooth sensitivity, it may have to do with your diet. Limit your intake of these foods and try to make sure that you are brushing and rinsing about twenty minutes after consuming them. Don't brush too soon after eating, or you may damage your enamel further. If you are not having much luck with a change of toothpaste, or eating habits, it might be time to consider painted on barriers. These barriers, which include fluoride varnish and plastic resin, can be painted on to protect your enamel. They wear off over time (from months to a couple years, depending on the material used), so it is not a permanent solution. If you are someone who handles stress or discomfort by clenching and grinding your teeth, or if you are doing it while you sleep, you should try and get that under control. Teeth grinding is another major contributor to eroding enamel and can leave you with less tooth, as well as less enamel. © 2019 Cosmetic & General Dentist, Orthodontist - Smiledoctors.ca. All Rights Reserved.